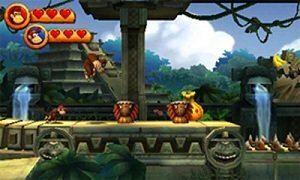 Donkey Kong’s smash-hit return to platforming is being rebuilt from the ground up for portable play on the Nintendo 3DS system. Donkey Kong Country Returns 3D brings back all of the ground-pounding, barrel-rolling action of the original, but this time it comes to life with stunning 3D visuals, including local wireless multiplayer and 8 new levels. Join Donkey Kong on his adventure to reclaim his stolen banana hoard as you explore over 70 levels filled with richly detailed environments. 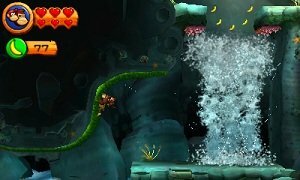 Guide Donkey Kong and his pint-sized friend Diddy Kong by running, jumping, swinging, rail-riding, and barrel blasting to scour 8 original worlds plus 8 new challenging levels in an unlockable 9th world. All while searching for lost bananas, hidden secrets, and puzzles pieces. You can also share in the adventure by playing cooperatively with a friend via local wireless. Play in Original Mode to experience the game as it was originally designed, or play the original levels in New Mode with new enhancements for on-the-go ease of play. Rebuilt and optimized for portable play on Nintendo 3DS. 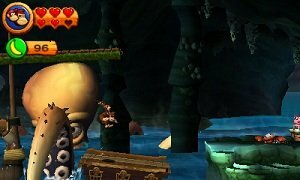 Run, jump, climb and defeat enemies through diverse environments until you retrieve Donkey Kong's stolen banana hoard. Cooperative multiplayer lets you connect with a friend via local wireless. Play in Original Mode or check out New Mode with new enhancements for on-the-go ease of play. Unlock 8 brand new levels within the Golden Temple. 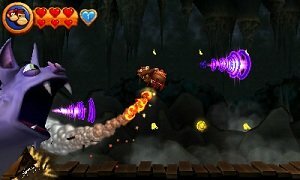 Donkey Kong’s smash-hit return to platforming is being rebuilt from the ground up and optimized for portable play on the Nintendo 3DS system. Donkey Kong Country Returns 3D will launch in summer of 2013 with all of the ground-pounding, barrel-rolling, platforming action of the original brought to life with stunning 3D visuals.